Concept and scheme design of roof + esplanade as well as detailed design of esplanade Castro Mello arquitetos with consultancy service provided by gmp and schlaich bergermann and partners Detailed design of roof gmp and schlaich bergermann and partners Design of bowl Castro Mello arquitetos, São Paulo. 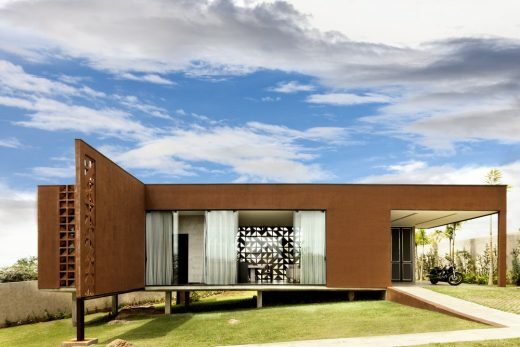 Brasília is the only city dating from the 20th century that has been declared a UNESCO World Heritage Site. With its range of public buildings, the “ideal city” built between 1956 and 1960 is one of the icons of the Moderne style. 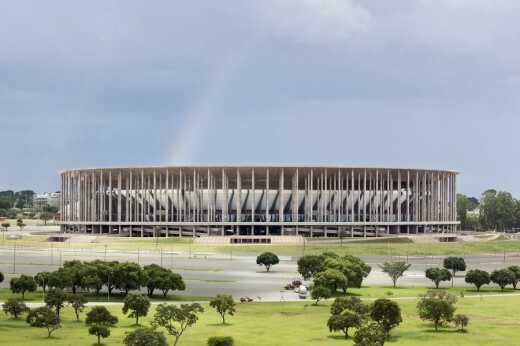 In this context gmp Architects, in cooperation with schlaich bergermann and partners (sbp), produced the design of the Brasília national stadium for Castro Mello Arquitetos (São Paulo). 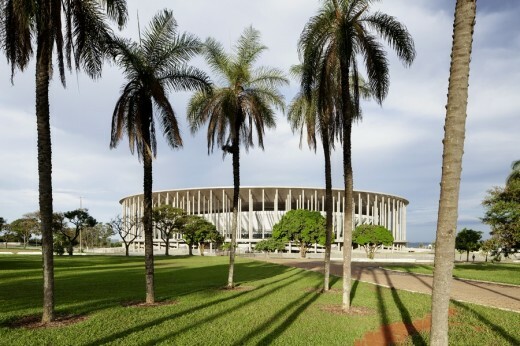 It was constructed in the place of the former Mané Garrincha stadium. 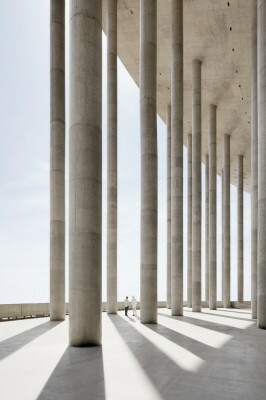 Eduardo Castro Mello was responsible for the design of the 72,000-seat bowl; gmp and sbp produced the elevations of the esplanade as a characteristic “forest of columns”, and a double-skin suspension roof. 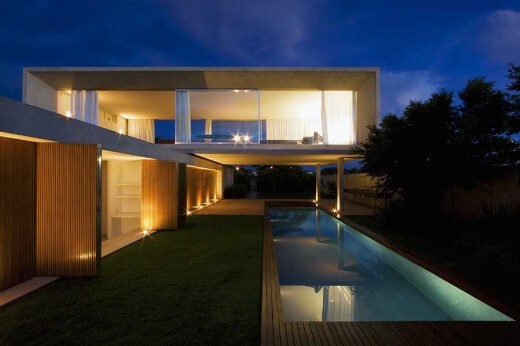 The objective of the design was a solution that does justice to the architectural history of the place, with a clear reference to the city’s tradition, and yet has its own distinct contemporary style. As the city’s largest building, located on Brasília’s central axis, the composition was developed as a monumental building volume which integrates seamlessly into the urban design context. To achieve this, the stadium bowl is surrounded by an esplanade which comprises all access elements and supports the roof on its “forest of columns”. This clear gesture is emphasized by the minimalist, almost archetypal design of the components – the key material being concrete. 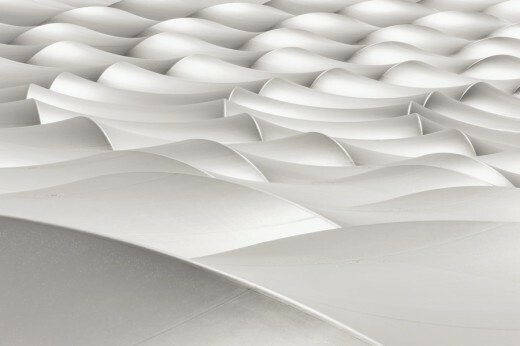 The circular suspension roof is a doubleskin structure – the upper skin consists of a PTFE-coated glass fiber fabric while the lower membrane is made up of an openmesh, back-lit fabric. 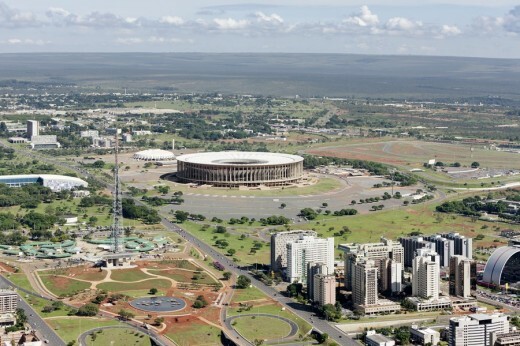 Brasília National Stadium shortly before completion. The city’s largest public building is located directly at the central axis dissecting Brasília’s basic urban layout. The stadium bowl is surrounded by a circular esplanade which contains all access elements and includes a “forest of columns” which supports the roof. 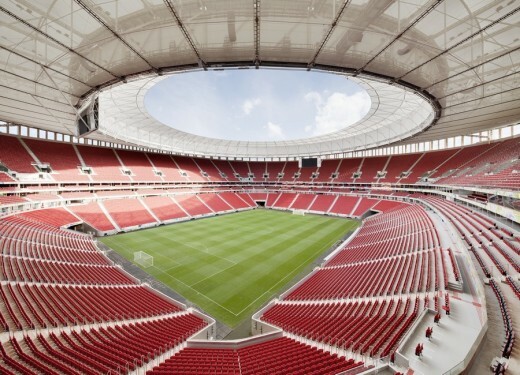 In the stadium bowl designed by Eduardo Castro Mello, the filigree suspended roof construction created by the German stadium designers has a real presence and provides unrestricted views.